Hi! 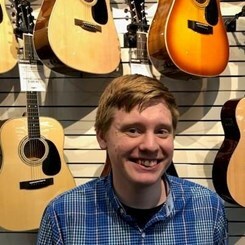 I'm Jonah Burkholder, a part-time employee of Music & Arts in South Forsyth. I grew up in a very musical family, (both of my parents teaching Piano and Voice, my uncle played pretty much everything, etc.) so it was only natural that I would be infatuated in music. I've been playing piano since I was 6, got my first guitar at 5(actually put in time to teach myself around 10 years old.) I have also dabbled in drums and bass here and there. Music & Arts is a musician's paradise, regardless of experience. I love watching the start of the next generation of music, it's my favorite thing!